You will be given a free reference e-book to read which has 419 pages And the test will be based on that e-book. A certified financial planner (CFP) is someone who has received a professional certification designed for professional and expert financial planners mainly awarded by the Board of Standards for certified financial planners in the US. The certification may also be conferred by the Canadian Financial Planning Standards as well as the other 22 reputable organizations that are now affiliated with the Board of Financial Planning Standards. In order to receive a certificate in financial planning and work as an effective certified financial planner, it is essential for you to meet all the examination, ethics, experience and education requirements set by the state or the country where you are in. The educational requirements needed to become a CFP should cover vital areas in the field including general principles linked to financial planning and finance, employee benefits planning, insurance planning, estate, transfer and gift tax planning, federal and state income tax planning, securities and investment planning, estate planning, retirement planning and asset protection planning. Fortunately, Brainmeasures is now around to offer a CFP practice course for free. This enables you to boost your chances of passing the test associated to the field and receive a CFP certification since it covers all areas required for you to become a more effective expert in financial planning. The good thing about this is that this course is available for free at Brainmeasures so becoming a more knowledgeable expert no longer requires you to pay a high price. 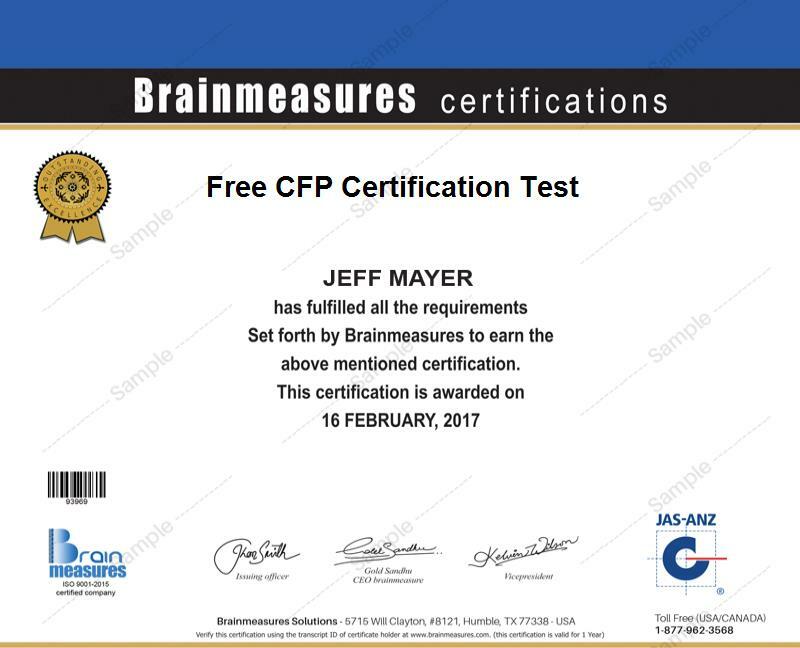 The CFP certification course which is now introduced by Brainmeasures to the public allows you to enjoy a reference study material and practice test offered for free. This is extremely beneficial for you especially if you dream of understanding everything that you need to learn about becoming a certified financial planner. The CFP study guide included in this free CFP practice course contains all information that you need to understand about financial planning and any other areas related to it so passing the CFP practice test will no longer become a problem. The online practice test which also forms part of the program aims to assess your knowledge in the field so you will have a clearer idea if your background is already well-detailed. This is a huge help if you want to obtain higher chances of receiving a CFP certification. Enrolling in the free CFP practice course offered by Brainmeasures is definitely your ticket towards generating a more detailed background about your duties and responsibilities as a certified financial planner. The course is intended for those who have a strong desire to pass the CFP certification and work as an effective and certified financial planner, investment planner, financial planning consultant and any other professionals whose responsibilities are more focused on estate, retirement, employee benefits, income tax, risk management and insurance planning. Receiving a CFP certification can also help you obtain an even higher salary. After you pass the actual certification exam, you can start working as a financial planning consultant and enjoy a salary of approximately $52,000 to $128,000 yearly. Your received certification can also transform you into a certified financial planner and start enjoying a salary within the range of $82,000 to $163,000 annually.